Made exclusively from Pinot Noir grapes, this unique Grand Cru champagne reveals a palate that expresses all the purity of this varietal. Fresh yet full of strength, it’s equally enjoyable with cocktails as with a three course meal. With its golden colour and deep, rich flavours, this exceptional wine is a worthy ambassador for the House of Marc : its black pearl. "Black pearl", a pure Grand Cru Pinot Noir, has made its mark on wine judges everywhere. They’ve been full of praise, not just for the intense, lively nose bursting with floral notes, citrus and white fruit, but for the persistent fruitiness on the palate as well. A very well-balanced blanc de noirs whose remarkable freshness makes it ideal as an aperitif. Origin : A.O.C. Champagne Grand Cru : Hand Picking. Grape varieties : 100% Pinot Noir. Yield per hectare : 10 000 kg/ha. Terroir : Chalky sopes. Average age of the vineyard :35 years. Vinification : Champagne made using grapes from a single harvest, Produced only in exceptional years with the best ageing potential, using exclusively the « cuvée » the first juice of grapes. Fermentation in temperature controlled stainless steel vats. No malolactic fermentation. The Wine is stabilised using cold temperature and lightly filtered, before being bottled and aged "on lattes" 60 months.Traditional manual disgorging. 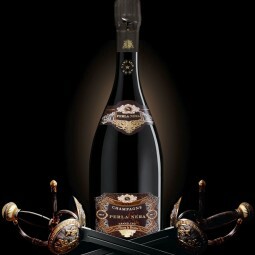 Pairing : This is a well structured Champagne ideally paired with food yet equally enjoyed alone as a luxurious aperitif. 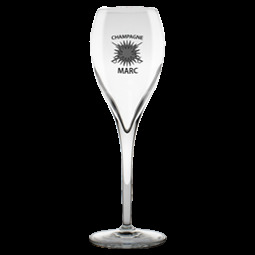 Refined curves Box of 6 flutes Champagne MARC, created by Arnaud LALLEMENT.